"This ruff looking wrestler might not win any beauty pageants but inside the ring, he is often top dog. A clean fighter with a wild side, he uses his feral instincts and powerful body to wreak havoc on his opponents. 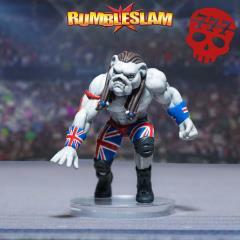 Whether it’s a high speed British Bulldog off the ropes, or a terrifying Dogfighter from the turnbuckle, this canine contender constantly brings his A-game." Resin miniature supplied unpainted and unassembled with a unique character profile card and clear acrylic base. Note that clear acrylic bases may have a colored peel-able protective film. Miniatures come unpainted and some assembly may be required.